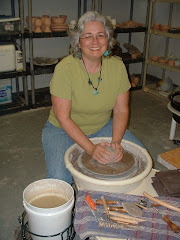 A great new book about North Carolina Potters, from the NC Pottery Center. I got a postcard about this, said it was a Cloth bound book for just $29.95 and had 192 or so pages. I thought there must be a typo on the price, so I called the pottery center, and it really was that price. What a value. What a resource, as well. And some of the proceeds from sales seems to benefit the center. Anyway, ordered it and it was here in two days. Now I'm trying to read one chapter every morning at breakfast. I have been delighted with the interviews and the photographs. Check it out! The hard thing about clay is that you have to finish what you started. I decided to roll out some slabs for the pierced vessels that I make and take it home to work on last night, maybe watch some TV. The sad thing is that I was rolling the clay out at 7:00pm in the studio, having worked a couple of hours to make other things and unload a kiln. So with high expectations in my head and little real confrontation of how long it would ACTUALLY take me to finish, I started working on these at about 11:00 pm at home. Wee hours of the morning later I was done. I now have the slow thinking and cloudy head due to lack of sleep. I don't know why but time is always the element I think I can overcome and continually get proven wrong as it takes as long as it takes. But today it may take longer that it should take because of tiredness........Off to the studio to make some more pots! These are some of the things I have been working on--commissioned orders for individuals, galleries and a new (for me) Botanical Garden in Virginia. The kilns have barely had time to cool down. One load goes out and another right in. Yesterday was a throwing day, which was nice. I had some reclaim clay that I made large bowls with, dried out more reclaim clay and threw small and medium bowls in white stoneware. Today I hope to find time to trim and make some handbuilt work for the orders. On a dog note, I took Cherokee to the dog park near work. This was our second visit. He had a great time the first visit with 2 other dogs. Yesterday was not as pleasant because the dogs that were there were playing pretty rough and tumble. He was content to watch from the sidelines and check out all the different smells but really didn't run and chase with the other dogs. It seems like dog parks are a little mini Peyton Place (a scandalous 60's TV show about the goings on behind closed doors in a neighborhood just like yours) as the other owners talked about dogs and their people that weren't there. I was greeted as the person who had the Retired Greyhound from "last week". He's probably now known as the "stand-offish Retired Greyhound". You can see that all that gossip didn't really bother Cherokee. This is his "It's six o'clock and time to go home because I am BORED" look. I've just come off of jury duty and it was an interesting experience. I have served as a juror in a civil case involving parental rights in the past and that was a difficult thing because we were being asked to decide if a parent's rights to their child should be forever, permanently terminated. Not your cake walk through the park. This time I was seated for selection during a case that involved extreme personal injury with a mother and unborn child. Ultimately I was dismissed from the selection because of personal viewpoints that would make it hard to be impartial for one of the sides of the case. All of the process got me to thinking about how hard it is to be truly impartial. Some of the jury criteria they seemed to be looking for was personal experience with injury, pain, etc. What a tightrope balance for both lawyers' sides--too much would make it hard to be objective; too little would make it hard to understand the gravity of the situation. Yet we were told that we should not put ourselves in the place of the injured or make decisions from empathy or sympathy. Wow, what a tall order. The bright news is that I get paid $10 for my time, and my boss can't fire me for having to miss work for jury duty. But my boss can make me work overtime to finish those things that I missed out on while at the courthouse, and they won't even pay me for it. The joys of self-employment. I wonder if there is a union movement for the self-employed representing their rights against their self-employers. One of the strangenesses of life! 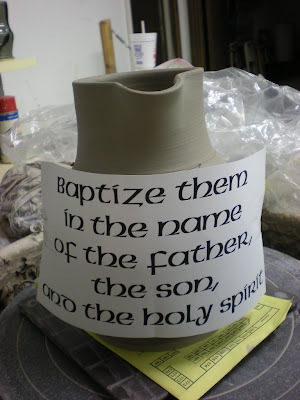 These are a few shots of how I determine and place carved writing on pottery. With bowls or plates, when the writing will be along the circumference of the piece, I measure the diameter of the circlular opening and multiply this by 3. So, if a plate is 10" across, I'll have about 30" for the type. This little gem of geometry (pardon me if it is really algebra, it's been a long time) was something I took home from the Hayes Bayless workshop. I'm sure my high school math teacher would say that was required knowledge to pass their course, but I had certainly forgotten it until reminded by Mr. Bayless. You can also use a handy sewing measuring tape to get a rough figure if you forget the formula! Once I have the space, I go to the computer and enlarge the type until I get the size needed for the circumference and print it. 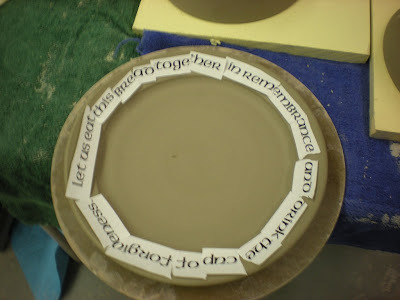 At this point you could cut and angle the pieces and trace the writing on the plate using a dull pencil for the outline. I prefer to wing it, and just use the visual length of the words to keep me in the ballpark, making minor adjustments as I go. This type face was American Unical (no caps in the typeface, so you have to do all lowercase or make up a reasonable substitution using your imagination and those years spent perfecting the alphabet in second to fourth grade). I'll try and post images of the finished pieces when glaze fired. 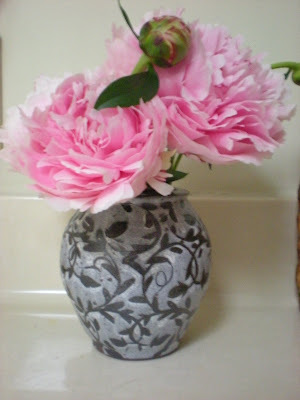 Delightful peonies (now featured in my garden) in a Michael Kline pot that I obtained at the Mint Museum show last September. They are gracing my bathroom counter. This is only possible because Jade, our ancient and ornery kitty succumbed to liver disease a month ago. It was sad to see her go, however I do not miss having kitty litter all over the floor and wondering if she sampled your Dixie cup of water with her paws left from your midnight foray to the bathroom. So, these flowers are in her honor. We took a quick jaunt up to Indianapolis to visit Jim's folks. Weather was quite nice and we got to see a great performance of Doc Severinsen and Gil Gutierrez and Pedro Cartas with the Indianapolis Symphony Orchestra. They have a really great blend of jazz and Spanish music. On other music news, Tides of Man is getting together a tour for the summer and the release of their album will be this summer. They are very excited. For those who don't know, Spencer Gill, our son, is in this band and they have signed a record deal with Rise Records, an indy label. We saw tentative dates and locations and boy is that a wild ride! If you are on Facebook, you can catch them here.